A communication solution for people with language disorders. This start-up will be present at CES 2019 at La Poste’s French IoT stand. The Gong application is the first solution co-created by speech therapists, patients and families. 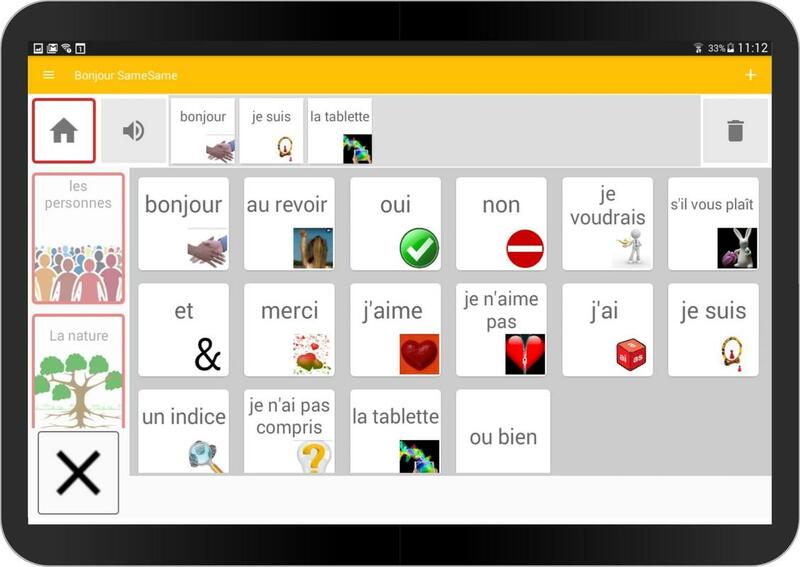 It offers aphasia patients the possibility to communicate with the people around them again, whether with family members or caregivers, through an app both easy-to-use and customisable. Samesame, the start-up company from Lyon, as we know it today, resulted from the meeting between Guénaël Brunet-Rio (speech therapist) and Alexandre Boulmé (engineer). Its application, Gong, was initially designed to help travellers communicate in foreign countries. Later, it was observed that speech therapists also used it during rehab sessions for patients suffering from severe language disorders. Gong is the first global solution designed for people with aphasia. It uses the latest “gamification” technologies thanks to its partnership with a CNRS laboratory, LIRIS (Laboratoire d’Informatique en Image et Système d’Information). The application enables people to communicate on a large themed panel (food, family, pain, everyday objects, wants, etc.) It is motivating for the patient, as it is highly customisable and offers new possibilities. Gong also adapts to the constraints of healthcare professionals by offering a functional tool. The application is constantly evolving thanks to user feedback. Today, Gong is a solution made by speech therapists, for speech therapists. After three years of testing the various existing solutions, healthcare professionals such as Guénaël Brunet-Rio discovered Gong and made it their number one tool to facilitate patient communication and work on speech rehabilitation. To be easy-to-use, Gong must be put in place by a speech therapist. Configuring a communication tool requires real competencies, which is why Samesame trains speech therapists so that they may offer the Gong solution. For patients, the application provides a strong capacity of communicating in simple ways through images or in writing. Communication is established in a precise way thanks to the text associated with the images. Gong offers the capacity to express wants, sensations, actions and many other things related to a wide variety of topics. Gong offers a database of 5,000 pictures to customise the application. It is also possible to add your own pictures in just a few clicks. The cost of the application may be covered by the government through the APA (personal autonomy allowance). Gong is, of course, compatible with all tablets (Android, iOS) and may also be accessed on the web or via smartphone. It can be used anywhere, which enables patients to communicate even without an Internet connection. An online discussion community was also set up so that family members can talk to each other remotely. SameSame has already made a name for itself by receiving a number of awards: Grand Prix Pépite, Headstart Funding. It was also a winner of the 2018 edition of the French IoT acceleration programme thanks to its solution, Gong, which will be presented at the 2019 CES at La Poste’s French IoT stand. Today, Gong is used by over 100 speech therapists in France. Find out more about Gong.